if you want to change the way you feel, you must start with the way you think. “Instead, let the Spirit renew your thoughts and attitudes” (Ephesians 4:23 NLT). We’ve talked about this before: The battle for sin starts in your mind, not in your behavior. The way you think determines the way you feel, and the way you feel determines the way you act. If you want to change the way you act, you start by changing the way you think. In addition, if you want to change the way you feel, you must start with the way you think. For instance, I could say, “I need to love my kids more,” but that isn’t going to work. Or someone could say, “I need to love my spouse more,” but that isn’t going to work. You can’t fight your way into a feeling. You must change the way you think about your kids, about your husband, about your wife, and that will change the way you feel, which will then change the way you act. 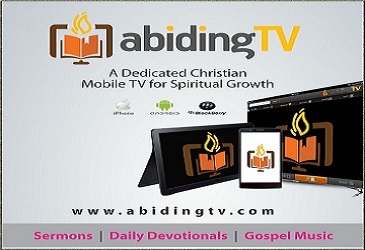 The Bible says, “Instead, let the Spirit renew your thoughts and attitudes” (Ephesians 4:23 NLT). Let me sum it up this way: You are not what you think you are; rather, what you think, you are. The battle for sin, the battle to deal with those defects in your life that you don’t like, starts in your mind. If you want to change anything in your behavior or anything in your emotions, you start with your thoughts and your attitude. Repentance has nothing to do with your behavior. It is about changing your mind, learning to think differently. 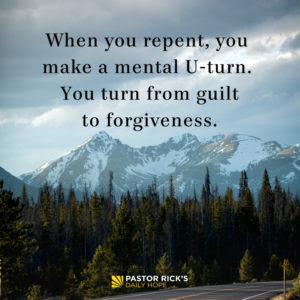 “Repent” simply means to make a mental U-turn. It’s something you do in your mind, not with your behavior. Changing the way you think will then affect your emotions and your behavior. When I repent, I make a mental U-turn. I turn from guilt to forgiveness. I turn from purposelessness to purpose in life. I turn from no hope to new hope. I turn from frustration to freedom. I turn from darkness to light. I turn from hell to heaven. I turn from hatred to love. I also change the way that I think about God. He’s not mad at me. I’m deeply flawed, but I’m deeply loved. I change the way I think about others, I change the way I think about my kids, and I change the way I think about my wife. I change the way I think about the world, I change the way I think about the economy, and I change the way I think about my past, my present, and my future. So being renewed in your mind means more than changing the way you think about God and Jesus; it also means you change the way you think about your own defects. The Bible tells us, “You must have the same attitude that Christ Jesus had” (Philippians 2:5). How does God’s Spirit help you renew the way you think? If repentance means turning from darkness to light, then why do so many people think it is a bad thing? How does repentance change the way you think about God?